In the original script, they would arrive at the spaceship, they would go inside, and so they would explore the whole spaceship and they they would see the pods and decide that this was a museum/ biolab vessel. The chamber that was referred to as the "pod room" was a portion of the spacecraft in which the alien creatures manning it had collected specimens of different aliens species from around the universe in a sort of futuristic zoological expedition. So clearly the ship, piloted by whatever species was out looking for whatever it was doing, collecting information, found this, put it in the pod, froze it and got the wrong one, one that was more dastardly than they'd expected. In its own terms, the thing was a captive that broke free and tried to take over the ship and killed the pilot but the whole thing crashed. Originally the discovery of the spacecraft would have seemed like a bigger find, and there would have been more dead bodies of alien creatures lying around in the ship, and this would have made the main creature of the film no so unique. 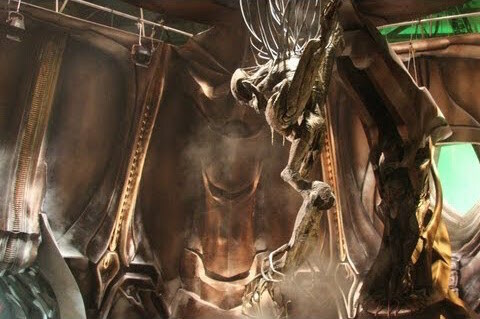 The set was several stories high and gloriously detailed with a metal/organic dichotomy that might have been reminiscent to some of the derelict ship from Alien. The creature took on the appearance of the alien that pilots the ship which would lead to it eventually killing the pilot and either it killed all the rest of the crew or this led to the crew killing one another from not knowing who was who, and so the pilot in the pilot room kills himself and crashed the ship on Earth in hope to stop The Thing. And so it was viewed that the pilot deliberately crashed it on the earth hoping that it would kill the creature. Now left with not knowing what to do, it gets outside the ship and freezes to death. So there was the original version of this creature and that is what we are supposed to see in the 2011 version of The Thing. It became all too expensive and complicated for the studios and so the whole back story was erased. The ship was steered by an alien race and the pilot of the ship controlled the ship with tubes stuck in its back, and operated the ship through those tubes connecting with the central core that was like the brain and the motor of thee ship. It was a futuristic take on a control centre. The director wanted it to be left vague and hard to understand otherwise it would resemble something too much of our own Earth based logic. d) What is the Thing? The director came to understand that The Thing does not have an original form. It’s just a lethal virus that had assimilated countless other life forms. It carries all the genetic information of its previous victims. That’s why it can create all these random forms. The microscope scene closely mirrors Carpenter's simulation scene where two cells one real and one imitation, become a single imitation cell rather than two imitation cells. The hostile thing's cell attacks a human cell, it takes over and the Thing cell takes over and then suddenly changes back into an imitation of the human cell. They merge into a blob (keeping the same mass in the assimilation process) and out of that blob two new cells emerge. A copied human cell (The Thing in disguise) and the same attacking Thing cell. If one visualized it, it looks as if nothing has changed. The beginning and the end of the sequence are the same, you start with two cells but it's not clear what is happening. So they copied Blair's animation from Carpenter's The Thing to simplify it. Perhaps the thing and its victim should keep roughly the same mass and weight before and after assimilation. The thing cannot invent mass or weight, and perhaps it should loses just a bit of weight because it burns energy/mass through assimilation. But to explain it without loss of mass, Kate's microscope scene and Blair's computer animation would be very hard to understand visually. A hostile Thing cell attacks a human cell, the Thing cell takes over and then suddenly changes back into an imitation of the human cell. The imitation is perhaps so perfect that it does not know what itself is, even as a consciousness, but is perhaps ultimately, unwittingly, controlled by this other thing. The characters Edvard, Juliette, Norris, Palmer and so on probably didn't realise that they were the Thing. For the sake of the psychological integrity of the imitation, it forgets the assimilation episode. But when it wants, when it needs to act, it takes over control and manipulates its next victims. Norris is the best example in John Carpenter's movie, he has pains in his chest but he doesn't even know why. Blair at the end of Carpenter's The Thing and is controlled by The Thing. And it is the same for for Juliette, when she talks to Kate about Colin. It is The Thing that makes her say these things but Juliette actually believes it. Matthijs van Heijningen Jr: That was the Pilot Alien, now mimicked by Sander. XidiouX:What was the intended role of the pixelated core which Kate discovers? Mr. Noc asks:Did the scene, or scenes, involving what has been described as a "pod chamber" ever make it into post production? Andy Bain:Why the decision to pixelate out the pilot? I've read that you felt it wasn't scary enough but could it have not been kept in alongside Sander thing? Matthijs van Heijningen Jr: The studio thought the whole back story was too complicated and wanted it to be removed. This is what I wrote on my Facebook site to explain. Richie asks: Did the ship crash or did it land? Matthijs van Heijningen Jr: In my opinion it crashed. Richie asks:Who was driving it and where are they? The enormity of the ship suggests it was not piloted by one person. Matthijs van Heijningen Jr: In the version I intended to shoot, the ship was steered by an Alien race and The Thing was a captive that broke free and killed everybody on board. The pilot deliberately crashed it on earth. Matthijs van Heijningen Jr: An escaped specimen. Richie asks: The Thing wakes up similar to when you wake up from a bad dream which is to say rather suddenly. Can this account for its radical behaviour? Matthijs van Heijningen Jr: Probably. Also it’s programmed to assimilate. Richie asks: I need a little clarity on its original shape and size. Teeth, fangs and body shape are more animal and don’t fit with piloting the vessel shown. Called the “pod room” – the portion of the spacecraft in which the alien creatures manning it had collected specimens of different alien species from around the universe in a sort of futuristic zoological expedition – the set was several stories high and gloriously detailed, with a metallic/organic dichotomy that reminded me instantly of the ship discovered by the exploratory team on LV-426 near the beginning of Alien. This resemblance actually did come up during our conversation with Haworth – miraculously still standing after being up for a full 24 hours in a rush to complete the gigantic set – who admitted that the influence of Scott’s film may have inadvertently creeped into his own design. "You know, I think we’re all big fans of the original `Alien’ and [H.R.] Giger“, he answered. “But…you kinda want to do your own thing. So there may be certain things where you’re like, the tonality of [another movie] is really interesting, so you borrow that from another movie. But you try to make it your own. You always get influenced to some degree by the work of others.” It was also imperative that the production designer and his team use the exterior of the ship seen in Carpenter’s movie – along with, according to (production designer Sean) Haworth, close-up photographs of bug antennas and dust mites, and imagining what they would look like writ large – as an influence. Although being that the ship was mostly seen covered with snow in the first film, he was also forced to use his imagination to fill in the gaps. It also helped that A.D.I. 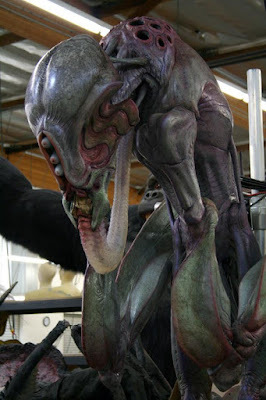 [Amalgamated Dynamics, Inc., the practical effects company that worked on the film] had already designed the look of the aliens who had been piloting the ship by the time Haworth came on board, giving him an idea of what sort of environment would be designed around their physical forms. Screencrave: I know you there were some reshoots at the end. Why did you guys decide not to go with the pods? Director Matthijs van Heijningen Jr.: It’s a long story. In the original script they would arrive at the space ship and they would go inside, so they would explore the whole space ship and then they saw the pods and then they figured this is a museum/biolab vessel. While prepping that it became really clear there was too much emphasis on the space ship. We left that idea when basically she has to try to kill the monster, we didn’t have time to explain that pod story because there’s no dialogue and she’s alone, so we abandoned that idea. I still liked it because initially the idea of having a Norwegian base in space was very appealing, like a whole space ship with species being wiped out and all these clues. Screencrave: Did you think about the aliens’ motivation? I don’t know if we ever in the Carpenter version, you know, know why the aliens came here. If it was just to take us over. Did you come up with a conclusion of that for itself? Director Matthijs van Heijningen Jr.: Well, as a virus it just wants to infect more people. Infect more specimen, and this virus can take over any organism. 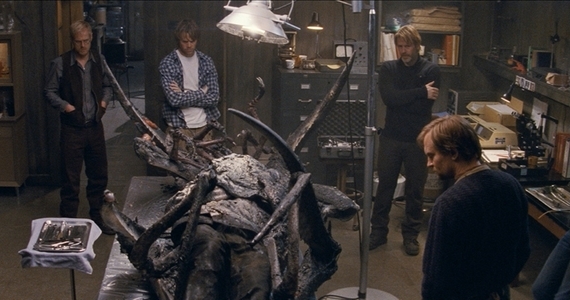 So that makes it sort of logical in a way, and in my mind the creature they find is not the thing, it was a host. It was probably a peaceful creature and taken over. It crashed on Earth and basically saw only ice around and thought well, I’ve got to freeze myself in waiting to be found. Mr Carmichael : The first exploration of the spaceship. Mooretallica asks: Was The Thing in the ice the actual original form of the creature, or just another copy a creature it has previously assimilated on another planet. XidiouX asks: Dear Matthijs, Is any novelisation of your movie planned? Director Matthijs van Heijningen Jr.: No. XidiouX asks: In the documentary produced by Amalgamated Dynamics showing the effects work they did on The Thing, we see a three-eyed alien, which was cut from the film, sadly, as this would have been a nice reference to the monster discovered in Campbell's original novella. What was this supposed to be and why was it cut? 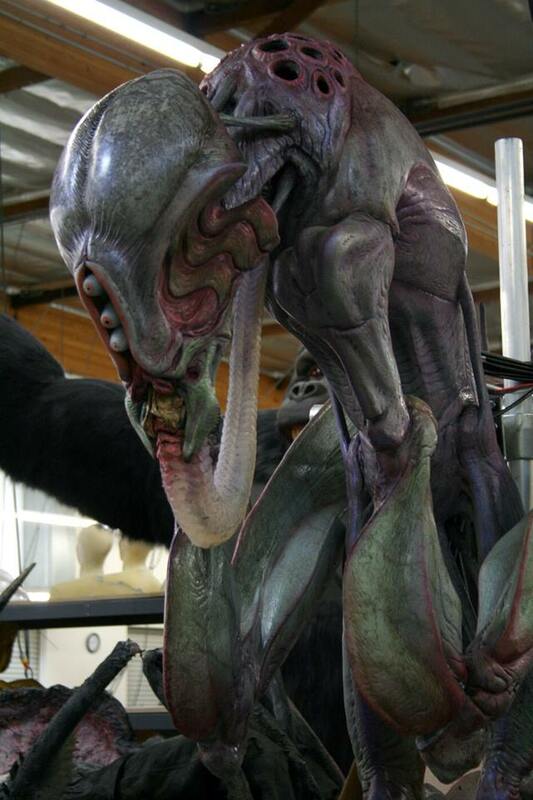 Director Matthijs van Heijningen Jr.:That was the Pilot Alien, now mimicked by Sander. XidiouX asks:What was the intended role of the pixelated core which Kate discovers? Director Matthijs van Heijningen Jr.:It was like the brain and motor of the ship. It was a futuristic take on a control centre. I wanted it to be vague and hard to understand otherwise it would resemble too much our own logic. XidiouX asks:When was Edvard assimilated? Director Matthijs van Heijningen Jr.:Just after the autopsy, the night Juliette gets assimilated. It knows Griggs is The Thing and uses Olav to secure that they actually leave. When Griggs dies, Edvard wants to leave with Colin and Lars, knowing that Juliette will take care of the camp. XidiouX asks:Is a Thing-imitation so perfect that it does not know what it is, even as a consciousness, but is perhaps ultimately, unwittingly, controlled by this 'other'? Director Matthijs van Heijningen Jr.:I think that is a right description. I don’t think Edvard, Juliette, Norris, Palmer and so on realized that they were The Thing. The Thing is so good in fooling everybody that it even fools its host. But when it wants, when it needs to act, it takes over control and manipulates its next victims. Norris is the best example, he has pains in his chest but he doesn’t know why. Blair at the end is The Thing and is controlled by The Thing. Same for Juliette, when she talks to Kate about Colin it is The Thing who makes her say these things but Juliette actually believes it. XidiouX asks: If a Thing does not know that it is imitation, for the sake of its psychological integrity, does it genuinely forget the assimilation episode? Director Matthijs van Heijningen Jr.:Yes. XidiouX asks:Why did the ship arrive at Earth and what happened onboard during its journey? Director Matthijs van Heijningen Jr.:See my answer in one the later questions. XidiouX asks:Your microscope scene closely mirrors Carpenter's simulation scene where two cells, one real and one imitation, become a single imitation cell rather than two imitation cells. What is your view of what’s happening here at a cellular level? Director Matthijs van Heijningen Jr.: A hostile Thing cell attacks a human cell. The Thing cell takes over, then suddenly changes back into an imitation of the human cell. Director Matthijs van Heijningen Jr.:To explain it without loss of mass, Kate’s microscope scene and Blair’s computer animation would be very hard to understand visually. Director Matthijs van Heijningen Jr.:A Thing cell attacks a human cell. They merge into a blob (keep the same mass in assimilation process) and out of that blob two new cells emerge. A copied human cell (The Thing in disguise) and the same attacking Thing cell. If you visualize this, it looks like nothing changed. The beginning and the end of the sequence are the same; you start with two cells and you end with two cells but it’s not clear what is happening. So we copied Blair’s animation to simplify it. XidiouX asks: It’s curious that the ship seems to have its main engines pointing upwards. Did it, as some of us have speculated, land/crash upside-down?